What can you do now about food? What would you say to someone like myself who wants to make a difference but has no clue where to start? I think that is a big question with my generation. Well, there's the pumpkin dance. But you don't have to start with that. HFCS may be the easiest thing to start with, because it's labelled. Don't buy any product that has High Fructose Corn Syrup (HFCS) in it. You'll be surprised how many do. At restaurants, check the condiments, don't use them if they have HFCS, and inform the wait staff why you're not. When people ask why you're doing all this tell them. Here's some background on High Fructose Corn Syrup and Obesity. This kind of thing is working: Hunts removes HFCS from all its Ketchups. About pesticides, buy local and organic food, like at Whisk. Ask for local food at other stores. Help with a community garden. Join a CSA. Write a letter to the editor. You don't have to do all of these things; these are some ideas. Start small and just do something. Every little bit helps, and you'll get more ideas as you go along. Your example will help others start. Also, don't feel bad about it seeming intimidating. On the one hand we have the most sophisticated marketing methods the world has ever known, fueled by megabucks from transnational corporations. 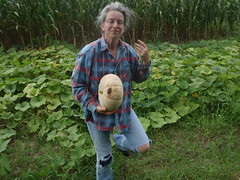 On the other hand we have, er, a few college professors like Michael Pollan, a few farmers who observe and analyze like Joel Sallatin, a few poets like south Georgia's own Janisse Ray, and so on. Even so, local and organic food is one of the few industries that has kept booming right through the economic downturn. People actually want food that's good for them and tastes good! Fortunately, around here we also have Georgia Organics! More about that later.